Great Infiniti Q30 car Leasing & Contract Hire Deals. Our Infiniti Q30 Lease Deals. Infiniti have been at the fringes of the luxury vehicle market ever since their European introduction way back in 2008. But that situation is changing thanks to this Q30. In a market where looks and individuality are what really sell, this Japanese premium brand's quirky style seems a perfect match to the demands of the consumer. That this style has matured into something so attractive in the Q30 won't do it any harm either. Good looks are all very well and good but you've also got to consider practicality too. 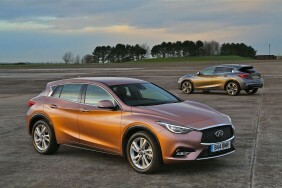 Thankfully, Infiniti haven't released the Q30 with a range of thirsty petrol engines as they've done with other models. The pair of diesels in particular are exactly what are needed for commercial success. Add a high quality interior into the mix along with competitive pricing and we can see this being Infiniti's turning point in Europe. Infiniti is not a common nameplate in this country, although the marque may be familiar if you follow Formula 1; they are a key sponsor for the Renault F1 team. For those of you unfamiliar with Infiniti, the brand was introduced to North America in 1989 to rival Toyota's luxury brand Lexus. Europe saw the first Infiniti back in 2008, although thirsty engines and unfamiliarity with the badge have kept sales on the low side. The Q30 looks to change that by aiming at the premium compact hatch segment and cars like Audi's A3, BMW's 1 Series and the car it's based upon, Mercedes' A-Class. Not only have Infiniti produced a genuinely attractive vehicle - vital in this sector - but it also offers a wide range of engine options and much of the quality buyers seek in this segment. This British-built model could prove to be a game-changer for Infiniti. Prices sit mainly in the £20,000 to £30,000 bracket and the Q30 offers three basic trim levels; entry-level 'Pure', 'Luxe' and 'Sport'. The 'Pure' variant kicks off at just over £20,000 for a 120PS front wheel drive manual car, with the 1.5 litre diesel an extra £1,000 or so. Standard equipment includes a 7"" touchscreen Bluetooth infotainment system, manual air conditioning, all-round electric windows, auto headlights, leather steering wheel and leather gearshift gaiter. One thing you don't get is alloy wheels: you'll need to option those separately or move up a trim level. On top of desirable 18"" alloys, 'Luxe' models also get LED front foglights, heated body colour mirrors and additional chrome detailing, not to mention greater levels of tech and comfort inside. 'Sport' models get a 15mm drop in ride height, 19"" alloys, colour-coded sills, dark chrome exhausts and a black front grille with a sportier front bumper. Cars fitted with the 2.2 diesel also gain active noise cancellation to help improve refinement. Go for that engine and one of the swanky trims and you'll top £30,000 without too much difficulty. This is fairly common amongst competitors however. If you're interested in the QX30 version with its raised ride height, wider wheelarches and roofrails, bear in mind that this derivative only comes with plush 'Luxe' or 'Luxe Tech' trim and with 2.2-litre diesel power, automatic transmission and AWD. QX30 pricing starts from around £30,000. All models receive seven airbags, hill start assist, brake assist, collision warning with active stop and the usual ABS, stability control and traction control.